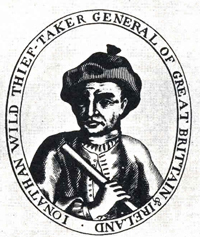 The self-styled “Thief-Taker General”, Jonathan Wild was one of the most famous figures of London’s underworld in the early 18th century, credited by some as being the city’s first organised crime boss. Born to a family in Wolverhampton, Wild – who had at some point undertaken an apprenticeship as a buckle-maker – was married and had a son when he first came to London as a servant in 1704 and although he returned to the city of his birth after being dismissed, he apparently abandoned his family and returned to the capital in 1708. Little is known of the first couple of years he spent in London but records show he was arrested for debt in March 1710 and sent to Wood Street Compter where he quickly ensconced himself and was even awarded the “liberty of the gate” – meaning he could leave the prison at night to aid in the apprehension of thieves. It was also during this period that he came under the influence of a prostitute Mary Milliner. 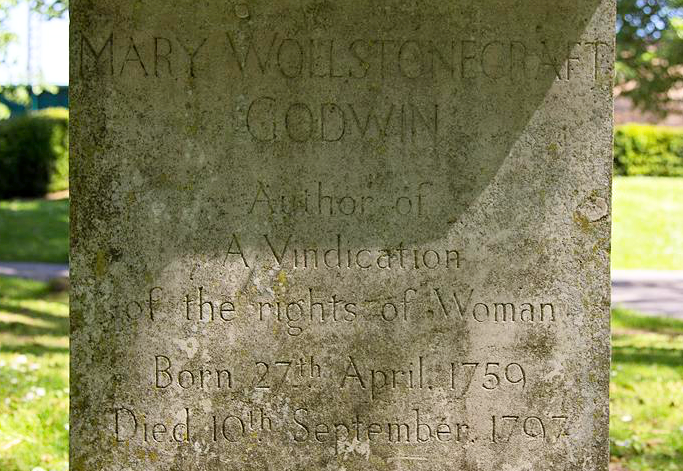 Upon his release in 1712 – thanks to an Act of Parliament passed to help debtors – he lived with her as her husband (despite his earlier marriage – and hers) in Covent Garden. Acting as her protector when she was on the street, Wild also branched into the business of being a fence or receiver of stolen goods and racketeering offences like extortion. In 1713, he joined Charles Hitchen to be his assistant. Hitchen, who had been suspended from his position as the City’s Under Marshal thanks to his practice of extorting thieves and their victims (it’s thought he may have taught Wild the craft), was then working as a thief-taker. Wild apparently took to the new role with fervour for when Hitchen was reappointed to his post as Under Marshal, Wild parted from his company and continued his work as a thief-taker, opening his own office in the Blue Boar Tavern in Little Old Bailey. Wild’s method of operation was simple enough – he would organise thieves to steal items and then, when it was announced that said items were stolen, claimed to have found them and would return them to the rightful owners for a “reward”. At the same time, he’d often also aid the police by bringing to justice thieves from rival gangs (including Hitchen’s, for they were now rivals) or those of his own gang who had crossed him – and in all his dealings manage to keep at arm’s length from the actual business of stealing and receiving. By 1718, Wild – who wore a sword as a sign of his authority and had pretensions of being a “squire” – was calling himself the “Thief-Taker General of Great Britain and Ireland”. It’s said that more than 60 thieves were sent to the gallows on the back of his testimony including the prolific housebreaker (and jail escapee) Jack Sheppard and his associate Joseph “Blueskin” Blake (who almost succeeded in killing Wild while he was awaiting trial). Wild’s pursuit of Sheppard was the beginning of his own downfall (although authorities had as early as 1717 passed an Act of Parliament aimed squarely at ending his criminal enterprise, it seemed to have had little effect, at least initially). Sheppard’s demise had been unpopular with the masses and the press of the day – and in February 1725, Wild himself was arrested for assisting in the jailbreak of one of his gang members. Other members of the gang turned against him and eventually, in May that same year, he was sentenced to death for the theft of lace. Having unsuccessfully attempted to kill himself by drinking laudanum before his execution, Wild was hanged at Tyburn on 24th May before a large and raucous crowd which apparently included an 18-year-old Henry Fielding. 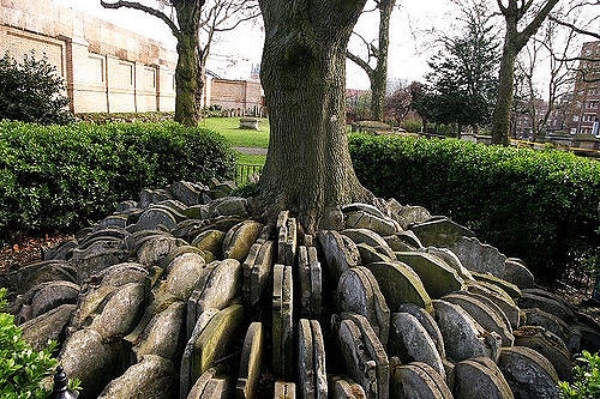 Wild was buried in secret in the churchyard of St Pancras Old Church next to his third wife (and one of his many lovers), Elizabeth Mann (she had died in 1718 and he apparently married another woman shortly after). His body was later reported to have been dug up and eventually, following the recovery of a body with a hairy chest from the Thames which was identified as being Wild’s, a skeleton said to have been his was donated to the Royal College of Surgeons (it’s now on display in the Hunterian Museum). The subject of numerous articles, books and ballads, Wild’s story has been since told numerous times and for varying purposes. Among them are Daniel Defoe’s True and Genuine Account of the Life and Actions of the Late Jonathan Wild, published in 1725, Henry’s Fielding’s ironic The History of the Life of the Late Mr Jonathan Wild the Great (1743), and John Gay and John Rich’s The Beggar’s Opera (1728) which features the character Peachum, said to have been based on Wild. To read more about Jonathan Wild, see Gerald Howson’s Thief-taker General: The Rise and Fall of Jonathan Wild . The location now known as King’s Cross, north-west of the City, takes its name from a monument adorned with an 11 foot high statue of King George IV which once stood on a site now occupied by King’s Cross Railway Station. The area had been previously known as Broadford Bridge or Battlebridge – the latter a name many associated with the apparently erroneous belief that it was here, at a bridge which once crossed the River Fleet, the Iceni Queen Boudicca (also known as Boadicea) ill-fatedly confronted the Roman Army under the command of Gaius Suetonius Paulinus. From the 1830’s (King George IV ruled from 1820 to 1830), however, the area took on the name of King’s Cross thanks to the erection of what Walter Thornbury described in his 1878 text, Old and New London, as a “ridiculus octagonal structure crowned by an absurd statue of George IV”. 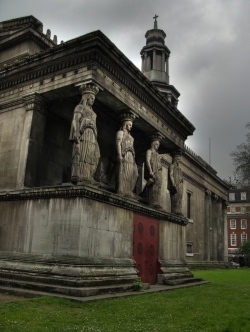 The structure, said to be 60 feet high, was erected at the intersection of Gray’s Inn Road, Pentonville Road and what we now know as Euston Road, and during its relatively short lifespan, was employed at different times as a police station and as a pub (complete, apparently, with a camera obscura in the upper level). It was completely removed by 1845 (King’s Cross Railway Station officially opened in 1852). 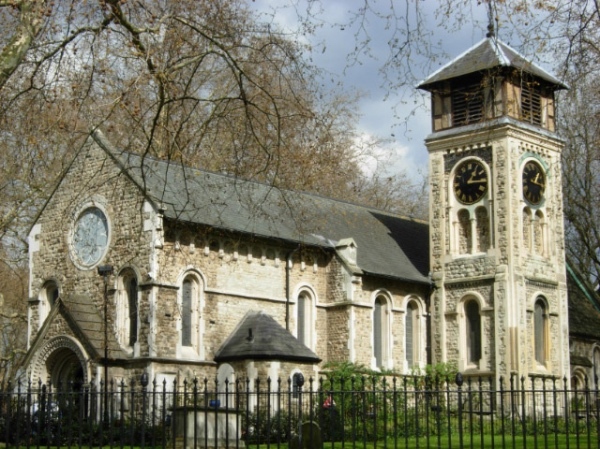 The area of King’s Cross has been settled back as far as Roman times – St Pancras Old Church is one of the oldest sites of Christian worship in England although the current church is Victorian – but it wasn’t until the 1700s and 1800s that it was transformed in to an urban area with the arrival of canals – including The Regent’s Canal – and the railways. Traditionally one of London’s poorest areas, it survived World War II bombings but subsequently suffered as the railways declined in the post-war period. By the 1980s, it had become notorious as a red light district. It has since gone through – and is still going through – a gradual gentrification process, however, with the 67 acre development King’s Cross Central among the projects currently under construction. Key attractions of the area include The British Library, The London Canal Museum, arts centre King’s Place, and the recently refurbished St Pancras Renaissance London Hotel. 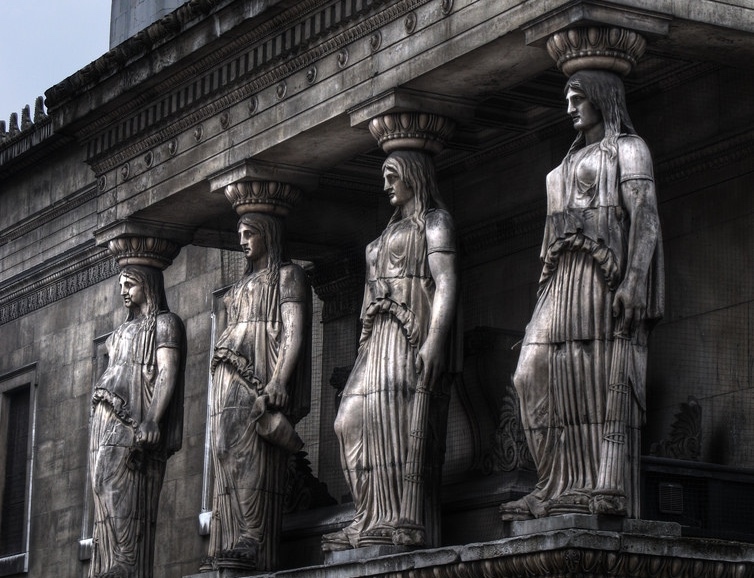 It’s also now home to St Pancras International – London’s Eurostar terminus (having been moved here from Waterloo) – as well as King’s Cross Railway Station which is believed by many, despite the lack of any evidence, to be the burial site of Queen Boadicea (it’s said she still lies beneath platform 9 or 10) and which is the home of the fictitious platform 9 and 3/4 from which Harry Potter catches the train to Hogwarts.